What is this thing, the “quantum”? It’s a bundle of energy, an indivisible unit that can be sliced no more. Max Planck showed us a hundred years ago that light is emitted not in a smooth, steady flow, but in quanta. Then physicists found quantum jumps of energy, the quantum of electric charge and more. In the small-scale world, everything is lumpy. Every modern advance in technology owes its success to the discovery of a very peculiar theory of the sub-atomic world called quantum mechanics. Unlike classical physics—the laws of bodies in motion, for instance, which are boringly predictable as they slavishly obey mathematical formulae—the traditional understanding of quantum mechanics is probabilistic, not concrete. One cannot predict behavior in the sub-atomic world in advance; one can only calculate odds. That is, until an observer steps up, leans in close and actually takes a peek at a streaking photon of light. Suddenly, in measuring the energy or position of a particle, probability becomes certainty, the indeterminate becomes concrete, the particle reveals its secrets to the observer. In other words, in classical physics, a tree falling in the forest makes a sound whether a person is there to hear it or not. But in quantum mechanics, nothing can be certain, nothing can be known, unless a mind is there to observe and measure what has occurred. Weirder still, recent experiments in quantum mechanics have suggested that a single photon of light is able to be in two widely-separated places simultaneously, a result that is utter foolishness in the material world of classical physics, but seems to be business-as-usual among the invisible particles that are the building blocks of our concrete, material world. If Einstein had been a baseball fan, he might have observed that God not only pitches a blistering fastball (299,792,458 meters per second! ), but quantum mechanics proves that he throws an unhittable curveball, too. Enlightenment Science, full of youthful hubris, claimed that it could unravel the secrets of the universe and prove that “God” was nothing more than a set of mechanical laws governing the passage of day to night and life to death. But God has had the last laugh. As the search for understanding drives us deeper into the foundations of life and the mechanics of the universe, we have discovered awesome complexity, unexpected mystery, and mounting evidence that some Genius might just be the Source of all that we are and see. Quantum theory has become the darling of modern physics because of its elegance and perfect experimental track record. Perhaps some future variation of the theory will free it from any connection to the mind. But for the moment, the philosophical implication of quantum mechanics is that the universe cannot exist in a vacuum—at the level of indivisible particles, the universe has been constructed with a built-in need for people. Or God. Or both. Perhaps the most awesome implication of quantum mechanics is the possibility that the universe only functions because it is continually observed by one who never blinks nor sleeps. The skies display his marvelous craftsmanship. I assume you wrote this to enter it in the science and Christianity showcase, but it not, please consider doing that. Good stuff! The implications of the need for an observer are conveniently ignored by most of those who try and pit science and religion against each other in debates…but reassuring for those of us who believe that science only reinforces our faith. I think the view of quantum mehanics you’re talking about is the Copenhagen interpretation. That is, Quantum Mechanics itself doesn’t say that nothing can be known without an observer present — but it is true that one popular interpretation of QM is that the act of observing causes the outcome to be determined. But QM itself doesn’t say this. QM just tells us how to calculate probabilities of certain events occurring. One only gets in to this issue when one tries to ask what it means that there’s a probability of X happening and a probability of Y happening. Does it mean that one will happen whether or not we observe it? Or does it mean that when we observe it, the act of observation selects only one of the two (or more) possible outcomes? The point you’re making is still a good one, I think — but you might want to be careful to separate QM from the interpretation of QM. You’re dealing with one interepretation of QM — a popular one, but not the only one. I do think one can go fairly far along these lines. I remember in a QM class I kept asking my classmates, “OK, so we can calculate a probability of essentially ANYTHING happening (assuming we know how). So who (or what) determines what will happen when we actually make an observation?” If you don’t believe in God, this can be a somewhat troubling question: About all you’ve got is random chance. But most of us tend to think life is somehow purposeful — there’s a reason for us being here. I appreciate your clarification. I’m a layman trying to make sense of what I read, so thank you for adding some precision and your own experiences to what I’ve said. My philosophy of science professor told me that there are three major interpretations of Q.M. and that every single one of that actually conflicts with the equations. So it’s hard to take anything from Q.M. or from the interpretations with much more than a grain of salt. Also, I’m not sure observing to a Q.M. Copenhagen theorist means a conscious observer the way we mean when we talk of observation in ordinary English. I haven’t figured out exactly what it’s supposed to mean, but I thought it was defined in terms of physics. Apparently “observer” can’t mean a device that serves as a surrogate for a conscious observer. That doesn’t work, according to many of the things I’ve read. But there are other possible ways to interpret QM that may end up eliminating the requirement for a conscious observer. I remember reading a ‘serious’ comment by a scientist in australia who was explaining how we are the observers which brought the universe into being. The things people do to avoid God…. David M. is right that there are several schools of thought, though Copenhagen is the original one. As for whether a given result happens when we are not observing, the famous two slit experiment has resolved the question. When no observation is made, the wavefuntion does not collapse and therefore is able to interfere with itself as if it were in two places at once. The range of possibilities is maintained. The self-interference stops the moment someone observes (and seemingly thereby fixes) the exact path of the “quantum bullet.” This is the so-called “collapse of the wavefunction” and is the genesis of the Copenhagen interpretation. One of the major alternatives, known usually as the “many worlds theory”, resolves the need for an observer by suggesting that all possible outcomes actually happen. Since all outcomes happen, there is nothing special about the “observed result”, because simultaneously other “yous” are observing all other possibilities. This interpretation does get around the “specialness” of the observer which makes materialists so uncomfortable, but it does so by positing something which is even more unlikely and almost by definition untestable. All of this to say, delving deeper into the details of QM does not necessarily make the picture fuzzier. In my opinion, interpretations like “many worlds” only reinforce the sense of materialist desperation. Thanks for your lucid comments. Your explanation of the many worlds hypothesis is much better than I could have done, and you’re certainly right that it replaces one odd situation with another that is positively bizarre. I think there’s still a problem with the definition of observer. In the two-slit experiment, I don’t have to be physically present making the observation in order to see the path of the “bullet” — I just have to provide something that will record its path, and then perhaps leave the room. That is, if I can arrange an experiment so that the path will be recorded, it has been observed. I just wanted to make that clear for people who aren’t familiar with the details. I don’t know why, but I’ve never found this issue at all troubling, even before I became a Christian. It doesn’t seem any more troubling to me than the idea that, while a die is in the air, I’ll conclude all outcomes are equally likely (if it’s a fair die) but when it lands, a single outcome is selected. In a way, it seems parallel: If I never observed the die, I would never know the outcome and still be able to calculate a probability of each face showing. In fact, the die has a particular face up — I just don’t know what it is. Your “rolling the dice” analogy fails to capture the most important point. Let’s put aside the 6 sided die and consider a two sided coin where slit A and B are like heads and tails on a coin, since this is more similar to the nature of the 2 slit experiment. A flipped coin, because it is of a size far above the limits of quantum effects, will always land as heads or tails. This happens whether there is an observer present or not. It’s true, one can not know the result without an observer, but once one makes the observation (by looking down at the coin lying on the ground) it is always either heads or tails. This is not the case in the two slit experiment. Without a measurement of which slit the photon passes through, it always passes through both! In coin terms, one would flip it in the air and look away, then look down and be shocked to see a coin that looked like both heads and tails simultaneously. This experiment has actually been carried out with things as large as molecules. Again, this “self-interference” is not merely a probability for unobserved things off in a room somewhere by themselves, but a real observable outcome. However, when an observer “watches” the 2 slits, the interference pattern disappears. The “quantum bullet” is no longer acting as a range of possibilities. It “becomes” (again, in the Copenhagen view) an actual photon which passes through only one of the two slits. In essence, the act of observing the path of the photon fixes the result as either heads or tails and precludes a combined heads and tails result. Thus the observer seems to have altered reality. This “specialness of the observer” is why many materialists don’t like the Copenhagen view. Particle-Wave duality! 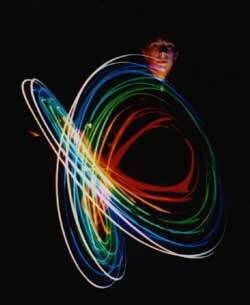 The photon is a wave, so it can go through both slits as any other type of wave could. When we observe the photon, it is as a particle – only goes through the slit of observation. The notion of quantum mechanics requiring an observer (i.e. “needing” a human) is anthropocentric in the extreme. Are you suggesting that stars/energy/particles on the edge of our so-far-observed universe only come into existance once we humans create telescopic technology capable of observation? No one said anything about “existence.” The photon exists whether it is observed or not. The issue is the nature of its existence. This is what the 2 slit experiment is about. When no observer is present a photon exists only as a probability governed by the rules of quantum mechanics, i.e. a wave-function. When an observer inserts himself into the mix, the photon ceases to behave according to the laws of probability. This is the so-called collapse of the wave function. No one is suggesting that the photon wouldn’t exist without an observer, only that its existence would be governed by quantum probability not certainty. It seems to me that the physical world derives from the raindow frequencies of light. Those things that seem solid and visible to us are those things which are, like us, derived of this range of light. Audible sounds too must be harmonics of the same light range frequencies. If a sound wave goes through two slits, does it behave like a particle when observed ? Are there quantas of sound ? Has it been tried? No more “Tao of Physics” for you. Most serious scientists don’t believe quantum mechanics has ANYTHING to do with “mind” or “consciousness”. The quantum mechanical act of “obervation” is merely a convenient shorthand for any magnification of a quantum event through cause-and-effect into the macroscopic, classical realm. The addition of “minds” into the picture is just a result of confused vocabulary. I have an opinion on the subject that we are considering quantum mechanics from our conventional point of views. Actually dual nature of the photon may be the more general explanation of natural phenomenon. The particle nature and wave nature may be its differrent approximations in different mathematical enviornments. We need to generate a rather more generalised quantum mechanical expression to have a clear view of the real thing happening in the actual universe based on De Broglie’s equation. What are the other interpretations of QM besides the Copenhagen? As scientists delve deeper into matter mathematical, probalistic mechanical, physical rules apply and develop. With these formuli scientists calaculate what properties the subatomic, ‘invisible’ force/matter has. Astronomical laws bring the skies to life. These rules apply to & grow from thought & experiment. It would be interesting to ‘piece together’ space so that we knew what planets orbited each star, and what moons orbit each planet. Wouldn’t it be miraculous if we discovered pattens of galactic atoms forming molecules forming cells, connected by light creating a giant mind. The Mind of God! one interesting question then would be; would the material on which the interaction happened have also been a small wave bounded by all the other waves/particles around it up until the point of the interaction?? im going to go google dual slit. of our reality or overall perception of a self existing in both a “world of ideas” and then in a seemingly “physical reality” world. I propose that light itself is the missing link in what I call “A Unified Thought Theory”, that theory hypothesis that that we selfmaterialize into existance events and or observations that to a far more developed mind all of our thoughts are combinations of awareness, thoughts and seemingly physical observations. However, light just as seeds may yield a plant or even fruit, some human beings weave beautiful unexplainably saturated bands of colored light that literally fills the entire yet to be known macroastropotential ever was it expanding or contracting again UNIVERSE! The reason Christ spoke of humility in my opinion is that to be one with all in true infinite God Bliss Consciousness, is to know eternity most likely for the soul is filled with the chance or opportunity to live out every persons life until you get it. I do not think GOD is remote. Light to me is GODQUANTA. I have been fortunate to have witnessed the material world transcend into light and an awareness that we, the human observer. limit our collective infinite experience of life itself, because were to busy playing the Cash Now God Bliss later mindset. We must teach our children to be more aware of Nature and their own awareness. We are a people obsessed with material possessions because 6 step assembly instructions is less work than giving oneself the time to really ponder what it would mean if all the infinite possibilities including of course all of the reality trapped in time based set limiters. Nature & or GOD left without the Observer most certainly seems a waist. if we are still looking at a truly infinite set of possibility set, than it is necessary to not fall into the linear & limiting, 1born 2live 3die 4decompose version of what was supposed to be without any limitations of the real number of potential outcomes in any event ocuring over a true infinite set is not completely known but to the One that not only observes and knows the spectrum as in the colors of light all possible outcomes, but can also see and know all the one over an infinite set of subtle variations. I think one should listen more to God than to ask of or want of the material world for only it’s own attempt to feel God like rather GOD IS LOVE so to be GODLIKE is to Be as CHRIST unconditionally loving. When one loves one bends light around the collective infinite & one soul or eternal “photon suitcase for the ages”. If you can’t even imagine being a person you hate and that you are literally hating a part of yourself when blended and or known or observed by the oneness of that which know all potential infinite outcomes.What you do unto your brother one does to oneself. Great line from the Bible. all life on earth. By expanding our awareness we expand the colors or frequencies that we can reach other people through. Christ was a Full Spectrum Being meaning healing was as natural as breathing. No matter what event outcome occurs there is and will always be that which sees all posabilities all the time and when this was shared with me from that infinite full spectrum of color and potentialities I had to laugh, then I cried, Empathy, then I realized the infinite is not remote it is within and the more you simply want to know that which has no limitations the more it will be revealed. I have the human condition to so one must do ones best to Radiate your Love which is Light Creation Growth Change Experience Contemplation transformation. Spectrum of all Spirit & Material mass, blended from Light, Love, Creation, experience & contemplation. This is the basis of dark energy. It truly is profo8und stuff to think about. What we thought of as vacuum is a SEETHING mess of incredible energy and ativity. but that activity does not crosss the threhold to become “real”. The implications of QM regarding the nature of God are much broader than the simmple Observer collapsi8ng the waveform problem. It is in the nature of TIME that “seprate” creator God becomes wither meiningless or TOTALLY DIVORCED fromt he character the is usual assigned to such a God. In a nutshell the issue is that to any observer “outside” the universe EVERYTHING from beginning to end, all of time would be one accomplished fact. THis allows certainly for an all knowing God but All-powerful? Not a chance. The Traditional Judeo-Christian God cannot exist in the QM world. The image of DEity that thrivews in this reality is the universal God, the God that is not seperate on any level from ANY part of creation. IN esscence creation IS God and God is Creation and to even talk about which is what is to not get the concept at all. The QM view of time does not allow for anything “ourtside to at the same time be inside AT ALL. Humanity and our universe would b e abeautiful complex ornament on God’s Shelf. NEver hchangable and certainly not able to be INTERVENED upon. To the persepctive of tst kind of “god” the moment of creation would have been a SNAP and ALL of the universe wold be there. all wavefoprms collapsed. Time started and ended int he same instant. Obviously the Biblical story does not fit AT ALL in that universe. LEts grow the heck up and stop telling silly stories to each other and pretending they are about God. LEts LOOK AT THE UNIVERSE and into our hearts and feel God is already there!! Guy, you’re trying to subject God to His creation which is nonsensical. He transcends creation. Good post. I am a born again Christian who recently posted a series of blog articles on quantum weirdness, covering weirdness in thick glass, double slit experiments, polarized crystals and entangled particles. You might find the five part series on “Quantum Weirdness – A Matter of Relativity” fun to read and enlightening. I believe I can explain where all the weirdness comes from. Regarding God and the mind of God, I am a believer and another of my blogs is devoted to visions from God. But that is entirely off topic. Seems that most of the comments and the logic behind them are based soley on the assumption that the universe exists just as we see and interpret it. Wouldn’t it be more realistic to analyze our observations with the outlook that all we are really observing is a very narrow slice of the electromagnetic spectrum? There is a very good book written about Quantum Theory, with a more philosophical approach rather than scientific. The Quantum Gods, by Jeff Love. If you can find it, I would definitely recommend reading it. In ancient Vedic texts from India, the words Prikriti(to mean that which is seen or meterial object) and Purusha (the observer) are inseperable.It is mentioned that they cannot exist independently of each other. It clearly means the match sticks which I think I have left back inside the match box cannot exist inside the box independently. The mere data or fact that the match sticks become visible when the box is opened every time is insufficient to come to conclusion that the match sticks are ‘there’ in the matchbox.The picture of the match sticks are established in the mind only and once they are there they retain the same shape and route. This process is named as ‘Maya’ in the texts.Another person or purusha witnesses the same object only relativly. The vedic texts which delve on these aspects are much more ancient than the christian texts. More can be brought to light by further interpretation of these vedic texts. Maybe this is the key to understanding the existence of Hell. IMHO, Hell is the state of being separate from God. It is a state that we choose by willfully rejecting him. If God ceases to observe us, then we cease to exist. I have a question that I have been puzzled about since reading on this subject. Can anyone tell me if the reason for the collapse of the wave function is due to the possible interference of the observer? For example, if I try to measure the temperature of a bucket of water with a thermometer, the actual temperature can be read without disturbing the system enough to effect the measurement of the temperature (too much, I know there will be an effect but it can be ignored). If I however try to measure the temperature of a molecule of water, the thermometer is no longer passive in the measurement but totally affects the actual measurement made. In the two slit experiment, is the observer actually affecting the outcome by observing the experiment whether it is an actual human or not? Again, I am completely new to this but that is my basic question about the whole two slit experiment and the affected outcomes. Hi! I have just arrived at the almost exact conclusions as you after studying quantum mechanics at a layman level. Apparently you’re about 4 years ahead of me. Do you have any reading suggestions (aside from God’s word, of course)? I understand and agree with the jist of what your saying, but the god that our limited ability to measure is pointing us to, has very little to do with a “Christian” Buddhist Muslim or any “kind” of god. Taoism, in its fundamental recognition of the universe being the momentarily perceivable manifestation of what are fundamentally two interrelated polarities or tendencies, is far more accurate. Far more accurate than any muslim or christian view of “god” , that much is obvious.